Title 350 billion immediately, another $100 billion on request by president published to cocoa-touch. The proposal immediately provides $250 billion, and another $100 billion could be used at the request of the president. Congress would have to review the expenditure of the remaining $350 billion, according to an outline distributed to reporters. The package includes a provision aimed at ``preventing golden parachutes'' for executives of companies who leave firms that have sold troubled assets to the government, said Senator Kent Conrad, a North Dakota Democrat. Stock Warrants Companies that sell debt to the government will issue stock warrants to the government so that taxpayers ``can gain as companies recover'' from economic difficulties, Conrad said. 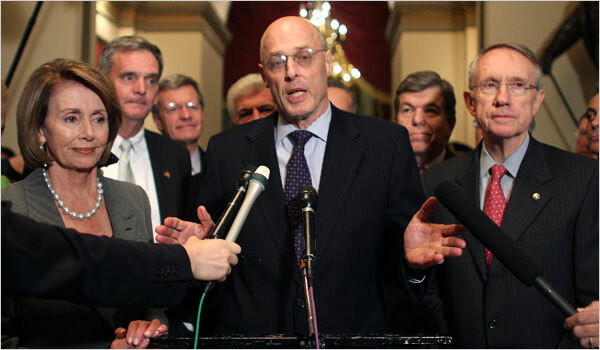 House Republicans initially balked at the cost of Paulson's plan. Missouri Representative Roy Blunt, the lead negotiator for House Republicans, said his colleagues wanted to ``bring both free-market principles and taxpayer protections to the table.'' ``I think we will be able to have an announcement'' later today, Blunt said. Republican leadership aides said that provisions favored by unions that own significant stakes in companies through pension plans were dropped. That includes a requirement for shareholder votes on executive-compensation issues. At one point during the negotiations, billionaire Warren Buffett spoke by telephone to a lawmaker involved in the talks to offer ``his best thinking about market reaction to various things,'' said Conrad. ``People are trying to reach out to the best minds that they know.'' lawmakers reduced the initial cost by half to $350 billion, with the remainder to be authorized later, and they added provisions creating an oversight structure and help to homeowners facing foreclosure. The compromise also includes a proposal by House Republicans, whose objections scuttled an earlier agreement in principle, that provides for government insurance for mortgage- backed securities. The plan also imposes limits on the compensation of executives at participating companies. ``It will be the first time in American history that there will be legislative restrictions on CEO compensation,'' said House Financial Services Chairman Barney Frank, Democrat of Massachusetts. Lawmakers want to announce a firm agreement before Asian financial markets open late today, Senate Majority Leader Harry Reid said. The deadline reflects concern that markets will be further rocked by lack of an agreement after the Standard & Poor's 500 index recorded its largest weekly drop since May. Treasury Secretary Paulson last night said the proposed deal ``will work and be effective.'' More work needs to be done, ``but I think we're there,'' he said. Government Bailouts Paulson and Federal Reserve Chairman Ben S. Bernanke proposed the plan after the collapse and bankruptcy of Lehman Brothers Holding Inc. and the Federal Reserve's takeover of American International Group Inc. earlier this month. They said it was needed to revive lending and restore the flow of credit to the U.S. economy. The proposal immediately provides $250 billion, and another $100 billion could be used at the request of the president. Congress would have to review the expenditure of the remaining $350 billion, according to an outline distributed to reporters.